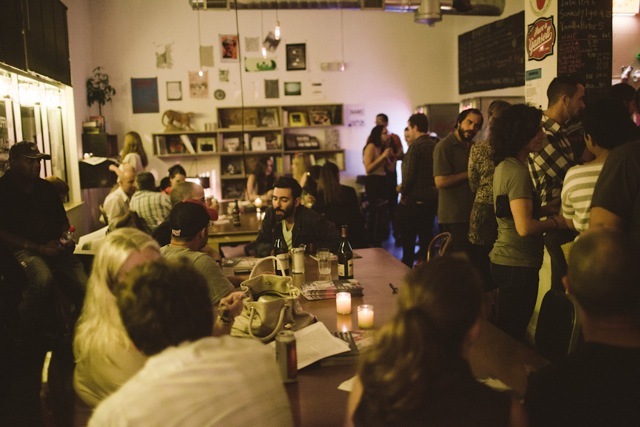 MIAMI – (Oct. 22, 2013) – Businesses and community leaders in Miami’s Wynwood district will be able to start work immediately on their plan to strengthen the area as a hub for artists and entrepreneurs with $43,500 from the John S. and James L. Knight Foundation. The support allows the Wynwood Business Improvement District to launch now, instead of waiting until next year when the organization can officially collect taxes from property owners in the area. The plan, spearheaded by the Wynwood Arts District Association, aims to make the neighborhood safer and more vibrant by funding more public art, improving security and sanitation and strengthening the area as a hub for artists and entrepreneurs. Original support for the Business Improvement District was provided to Wynwood Arts District Association by ArtPlace America, a collaboration of leading national and regional foundations. Wynwood commercial property owners agreed in June 2013 to form the Business Improvement District and tax themselves annually for the next 10 years to raise money for ongoing neighborhood improvements. Collection of levies for the Business Improvement District will begin in January 2014. Knight funding will allow work to begin immediately. A Board of Directors will be selected, along with other staff. Additionally, business operations to launch the plan will be put in place, including procurement, accounting and budget procedures. The Wynwood Business Improvement District will also decide the best way to allocate funds and prioritize different projects in the neighborhood—from boosting art initiatives to making the area pedestrian friendly through better lighting and more surveillance. In order to spread the impact to Miami’s larger community, Wynwood Arts District Association will also hold a number of workshops and produce a video series charting the establishment of the Business Improvement District. 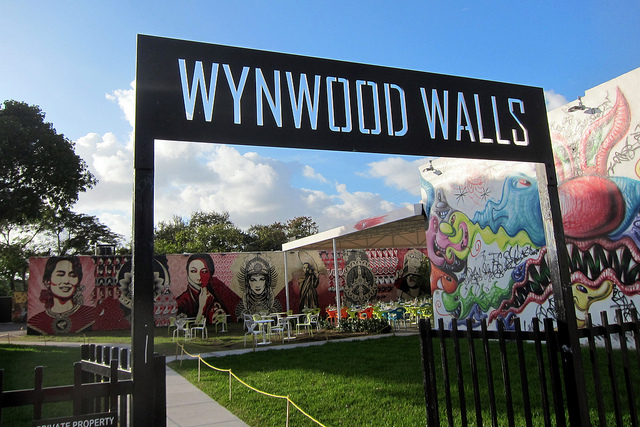 In this way, other neighborhoods tackling revitalization can learn from the Wynwood experience. Since its founding in 2009, Wynwood Arts District Association has fostered community development initiatives. This work has attracted visitors to the neighborhood, and directly benefited residents and underserved communities, such as the Women of Wynwood, which empowers homeless women by providing them with jobs in the community. The launch of the Business Improvement District forms one part of Knight Foundation’s efforts to inform citizens and create new opportunities by strengthening Miami’s startup and creative community. Knight has made significant investments in Wynwood in particular with the opening of The Lab Miami, a co-working space in the neighborhood; and the Lightbox at Goldman Warehouse, a performance and gallery space for arts organizations. 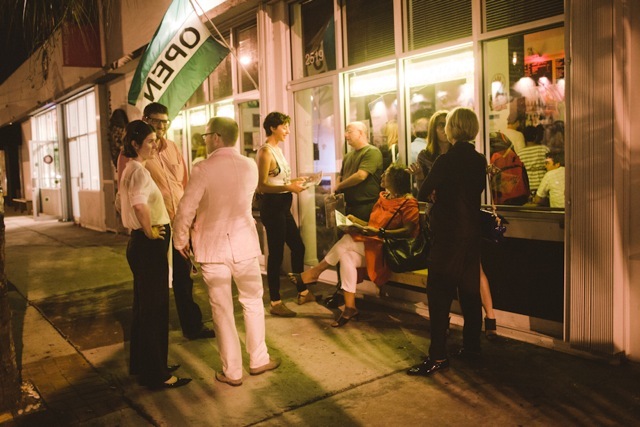 WADA, a community association, brings together art complexes, galleries, performing art spaces, restaurants, cafes, and other creative businesses that strengthen the concept of a true arts district becoming the catalyst for Miami’s international image. Knight Foundation supports the Wynwood Arts District Association to facilitate the immediate startup of the Wynwood Business Improvement District and to promote the development of a vibrant urban center that stimulates ideas and opportunity. Below, Jose Nava Lujambio, executive director of the Wynwood Arts District Association, writes about the effort. Photo credit: Flickr user Wally Gobetz. Wynwood is not just some nondescript neighborhood; its street art and industrial nature demand attention in the rawest sense, while refusing to conform to any specific set of standards. Shortly after beginning my work in Wynwood, I realized the immeasurable importance of being a part of the continued growth and transformation of this special place. Wynwood has the ability to positively affect the broader Miami community without ever having to compromise. People in Wynwood are committed to shifting the global perception of Miami. The recent decision by a majority of property owners—65 percent—to create a business improvement district proves this. They understand the need to invest in the community while collaborating to establish a joint vision for the neighborhood. The district, known as the Wynwood BID, will collect the first round of assessments from property owners in early 2014, but Knight funding will help fast-track these efforts so work can begin immediately. With the business improvement district in place, we will be able to expand our public art initiatives. We can improve security and sanitation, create a more comfortable experience for visitors to Wynwood and strengthen the area as a hub for artists and entrepreneurs. It will help other people appreciate Wynwood like I do. This is the second time I’ve lived in South Florida and discovering this neighborhood has changed everything for me. When I first moved here a little more than seven years ago, I was captivated by the beach life. It was exciting and fun in the beginning, like it always is when you discover a new place. However, opportunities for professional development seemed limited, and I decided to set off for Paris and New York, thinking they would have more to offer. I returned to Miami about 18 months ago for what I thought would be a temporary stay until I heard about an opportunity to work with the Wynwood Arts District Association. Seeing the possibilities here has convinced me that this is more than a temporary stay. This is a significant change for someone who was raised in numerous cities, from remote places like Manizales, Colombia, and Nelson, B.C., in Canada, to Mexico City, one of the largest metropolitan cities in the world. In Wynwood, I have realized that there is huge potential to create a significant impact in a growing, cultural community, which at its core is about its awesome people. The “creative class,” which Richard Florida often refers to as the engine behind the transformation and reinvention of our American cities, is very much present in Wynwood. Whereas a few years ago, South Florida was suffering from a brain drain; now the young and the talented are flocking to Wynwood to put their skills to good use. Places like The LAB Miami are fostering the entrepreneurial spirit, while Miami Light Projectand O Cinema are cultivating the performing arts and film culture in Miami. I’ve already worked on some exciting initiatives to support our neighborhood—from producing the new Wynwood website to developing pedestrian and cyclist infrastructure through a public art initiative. Now, I’m looking forward to even more. The Wynwood BID is helping set a clear direction for our community and our city. Come see what we’re doing in Wynwood. 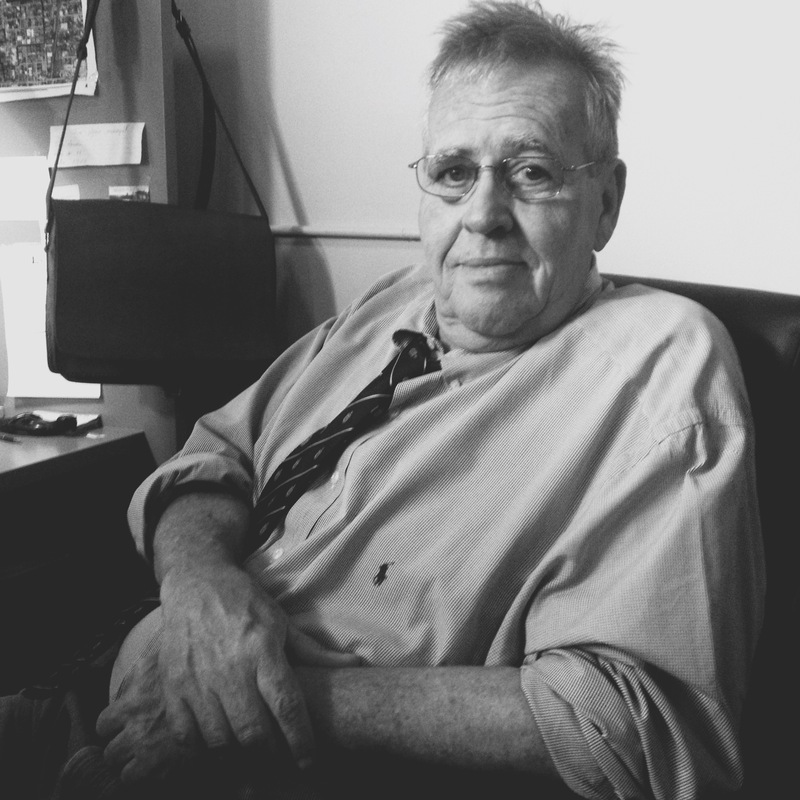 This post was first published in the Knight Foundation blog. Looking for a safe and kid-friendly environment for your child to grow, play, and learn while you check out the amazing Wynwood Walls? Play-In’s the place for you. The multi-sensory activity center incorporates all aspects of playtime, hearing, seeing, and touching, with the help of its indoor playground that aims to help children with their balance and confidence. The space is much more creative and innovative than your typical park playground – featuring different equipment for your child to swing from, build up, and glide down. Play-In also offers a wide array of therapies for children, including speech, occupational, behavioral, physical, and recreational therapy. Happy Hour starts at 4pm and goes through 7pm, where parents pay just $10 for each child and get three hours to wind-down in Wynwood. The activity center also offers yoga, music, art, and gymnastics, as well as summer camps, mini-gallery nights, and Friday movie night. During the mini-gallery nights, feel free to drop your child off at Play-In while you enjoy Art Walk from 7pm-10pm for $30 per child. Friday movie night is $35, and includes access to the Play-In playground, a movie, pizza, and juice. For more information, please call 305.576.7604, or visit Play-In’s Website. Artplace: Now that you are coming to the end of your ArtPlace grant period take a moment to think over the past year. What advice would you give to the new grantees? How would you encourage new grantees to leverage their ArtPlacegrants for maximum effect? David: To be open to new ideas and collaborations, and to build relationships. It’s important to understand that the power of the grant relies on its ability to build networks and relationships that most likely wouldn’t have happened without it. It also allows for thinking outside of the box and pursuing other projects and collaborations. You get to hear what people want. At first you might go in thinking, we need to improve security and sanitation, but when you let others speak up, you’ll find out that they have very creative solutions to problems, such as artist-designed trash receptacles or benches – things you wouldn’t have thought of yourself. Because you get the opportunity to work with people that you wouldn’t have expected to, you end up with better results because of the ideas and suggestions each person can bring to the table. As for the networking, you build relationships that last a lifetime. Some people who have met because of the grant project end up doing business deals long after the grant is up! June 5, 2013 – MIAMI, FL – June 4th marked the final day of voting to designate the Wynwood Arts District as a Business Improvement District (BID). An overwhelming 274 affirmative ballots cast by commercial property owners in Wynwood, voted the BID into action, either by mail over the past few weeks, or in person yesterday, at The Wynwood Walls. By approving the designation, commercial property owners will tax themselves yearly, based on the size of the property owners’ folios, amounting to $700,000 annually for the next 10 years. The taxes are invested into making Wynwood a brighter and cleaner environment, by providing basic necessities, such as waste receptacles, street lighting, and increased surveillance. The fund will also provide financial support for various Arts initiatives, such as the Wynwood Ways crosswalks, helping to evolve the Wynwood Arts District into a well curated, international outdoor center. By enacting the ten year measure, Wynwood property owners are looking to strengthen and compound their investment in the neighborhood. Once a manufacturing and industrial hub, portions of the Arts District have been re-zoned over the past decade to include commercial and residential tenants. Considering new retailers are opening up shop and condo developments are about to hit the market in Wynwood, the BID will provide resources to elevate the quality of life in the neighborhood. Art Basel and the satellite Art fairs that come to Miami in December, help to increase the interest in and attention to the artsy neighborhood. Expect to watch Wynwood evolve into the mega creative hub it’s growing to be. The Wynwood Arts District is currently entering the BID formation process. As part of this process, we will be entering an exciting new period in our urban development evolution. As a Business Improvement District, Wynwood will be able to develop its urban infrastructure and explore services that will ensure a safer and more pedestrian-friendly experience. ArtPlace spoke with the Wynwood BID Project Director, David Collins, about the most rewarding experience since the ArtPlace Grant, and what lessons he has learned in the process. ARTPLACE: What has been your best event or the most rewarding experience you have had during the course of your ArtPlace grant? What lesson did you learn from this success? DAVID: Our most relevant experience is not in the past, but it resides in the immediate future in the form of the BID election, which will culminate on June 4 at 5pm. In an intermediate sense, the election process itself is emotionally satisfying because it challenges us on a daily basis. Making the case for the BID, clarifying information and answers for property owners, and responding to raised concerns are elements which require us to be honest and straightforward. In other words, it is the election process itself which continuously teaches us about the values and priorities of property owners who lead the Wynwood community. The lesson here is to listen to others and value their opinions. Including these opinions in the plans for the establishment of a Business Improvement District will make our effort both, successful and effective. The ultimate priorities of the organization will not be based on the opinions of a handful of stakeholders, but rather upon the values and judgement of the entire commercial community. As of Wednesday, May 1, the Miami Trolley System has expanded its routes to cover the Wynwood and Midtown Miami neighborhoods. The best part? Riding the trolleys is free! The new extended Bicayne Route hasextended its stops to the Design District, Midtown Miami, and R. Clemente Park. The trolleys run on Monday-Saturday from 6:30 AM to 11 PM, and on Sunday from 8:00 AM to 8:00 PM. The trolleys come approximately every 15 minutes. There’s been a lot of buzz about the new project happening in Wynwood called Wynwood Ways, which aims to help the District grow and develop as a more pedestrian-friendly destination. The project, a collaboration between Miami Biennale and the Wynwood Arts District Association (WADA), got some time in the limelight with an interview via CNN on Monday, April 29. The first step of the project is complete. 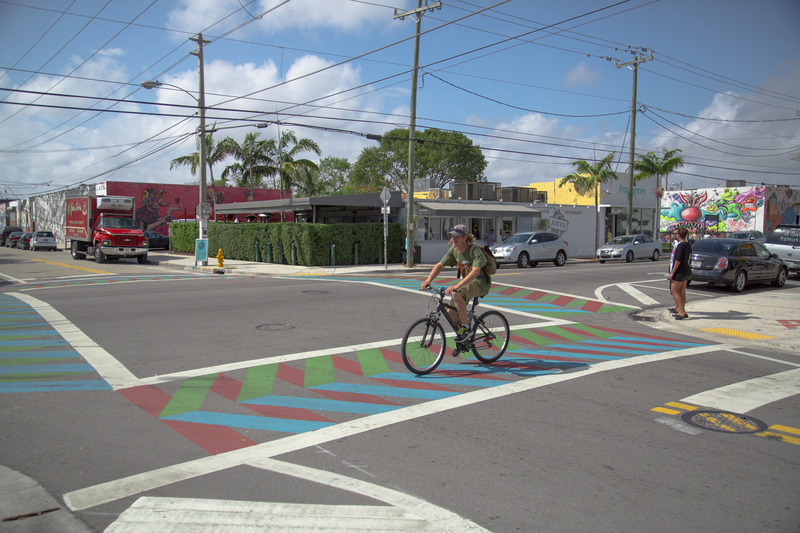 Miami Biennale and WADA teamed up with artist Maestro Carlos Cruz-Diez to create the area’s first artistic crosswalk. It features a kinetic design that actually changes as the pedestrian crosses. The crosswalk is dedicated to visionary Tony Goldman. “We’re at a moment where we’re trying to secure funding in order to make sure that the project is successfully completed,” says Jose Nava of WADA. “It’s important to note that this is an ongoing collaboration, and has tons of potential to transform this area of the city.” The project is expected to increase to 31 intersections and include other forms of new pedestrian infrastructure such as waste receptacles and bike lanes. 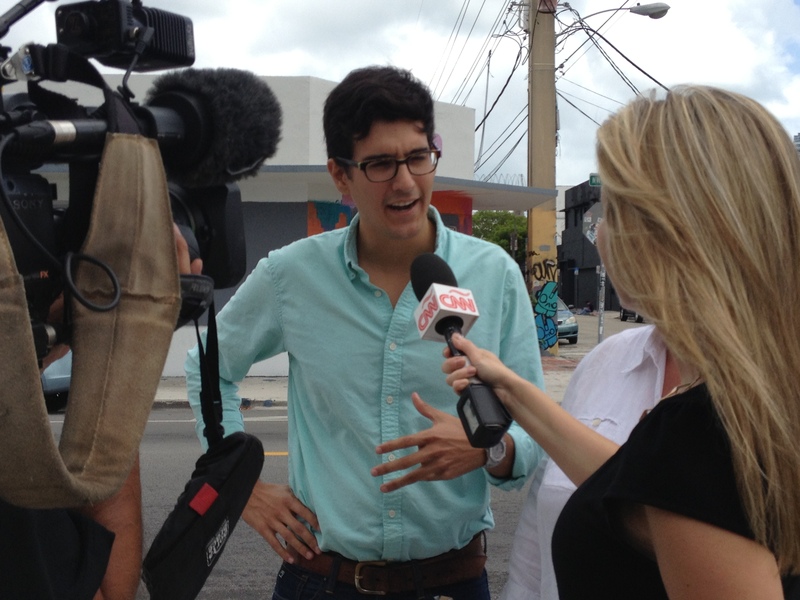 “We want Wynwood to be a place that is welcoming to pedestrians and has a focus on culture,” says Nava. ArtPlace spoke with the Wynwood BID Project Director, David Collins, about the project and how it will continue after the ArtPlace grant period is over. ARTPLACE: How will the work you’ve begun be sustained after your ArtPlace grant? DAVID: First, the Wynwood Business Improvement District initiative will have a single voice, so that the property-owners and tenants will be able to work together as one entity. This will be especially helpful in terms of everything we do with the City and the County. Second, we will have the financial resources that will allow us to make stronger the art and culture, which is already strong in Wynwood, and will allow us to make better those elements of our community that we need to roll up our sleeves and improve. Third, the BID will empower us to talk about Wynwood as a place, which we are creating, a wonderful pedestrian cultural destination. ARTPLACE: Will this work live beyond the grant period? DAVID: Yes, property-owners will be self-investing real money in Wynwood. What will happen here is this – in Morocco, I saw clay-sculptors up to their waists in clay, selecting their material. In Wynwood, there will be a palpable sense of creating our future with our hands. The fact that we have a ten-year renewable term for the BID is very important, it allows us to think about creative placemaking with a longer breath than just living moment to moment. In other words, ten years gives us time to try and do something here, as opposed to just thinking year-to-year. ARTPLACE: How has this work affected the work you will do beyond the grant period? DAVID: Thinking beyond the grant period, the establishment of a Business Improvement District in Wynwood will allow us to focus our efforts on how to self-invest in our community. Once the BID is established, it will then become a separate entity from WADA with its own financial resources and its own priorities. Since the BID will have the means and influence to do so, it will focus on providing the services and improvement efforts for Wynwood (i.e. private security, sanitation, lighting, advocating for City services, etc), leaving WADA to focus on marketing efforts and as the 501(C)-3 for all the non-profit, creative placemaking initiatives. ArtPlace spoke with Joseph Furst, Esq, Member of the Board of Directors for the Wynwood Arts District Association, about the ArtPlace Creative Placemaking Summit in January and how the initiative will be moving forward. ARTPLACE: Where does this movement go next? What ideas did you gain or lessons did you learn that you plan to apply to your initiative? What did you share about your initiative that was surprising to you or to other participants? What new opportunities for your initiative did you identify from conversations with other creative placemakers? JOSEPH: The Creative Placemaking Summit in January was a very enriching and motivating experience – it was thrilling to see all the different initiatives that are being developed nationwide and to learn from others’ mistakes and successes. I believe that the idea exchange during the Summit made us realize that we can do so much more with our initiative than just the sanitation and safety improvement aspects, which have been a priority for the BID so far. WADA and the BID can do a lot more to get engaged and involved with the community. We need to improve and expand our level of community outreach, not to be as hyper-focused in our own little world but rather to engage different people from different sectors because everyone may have different, valuable input. We need to share ideas with the community and develop arts-related activities and initiatives to be implemented with the priorities of the BID. This can come in the shape of artistic enhancements to the standard features of the BID, such as the artistic enhanced crosswalks that we see today in front of Joey’s. 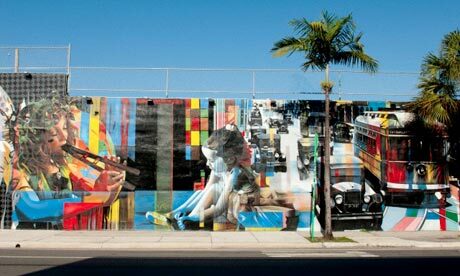 What’s important is that the focus remains on the creative component of urban placemaking in Wynwood.